There is no stress. Only stressful thoughts. Now, of course, we know stress is a real thing, but the sentiment behind this idea resonates strongly with me today, especially since I feel a bit overwhelmed with all that is happening in life. See, stress isn’t a concrete thing. It’s not something we can measure, see, touch, smell, or taste. It only exists as part of our thoughts, so if I can change how I think, then I can reduce my stress. If only it was as simple as writing that sentence. Last Friday, we found out that I am pregnant, and we are over-the-moon with joy. After years of battling against infertility, we are expecting a child. . . what a gift. Now, though, much about how we live needs to shift. At this time in my pregnancy, I am just bowled over by fatigue, and I’m taking the best naps of my life . . . you know the kind where you wake up and have to figure out where you are. I’m paying a lot more attention to what I eat, which means cooking a lot more. So between more food prep time and naps, I’m losing a few hours in each work day. . . and I’m happy to lose them, but it does mean adjustment. 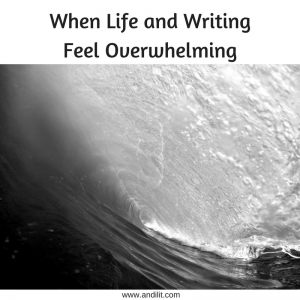 Add to that our upcoming Writers’ Retreat, the height of harvest and weed season in the garden, and the final stages of a major book project, and I’m feeling a bit overwhelmed. So I’m having to make some serious choices to manage, and here’s what I’m finding – when I make those choices, even before they come into play, I feel better. . . just knowing the change and space are coming. That’s how I’m changing my thoughts. Writing is not always about production; it’s about practice. I don’t have to always be putting books into the world. I can adjust my blogging, newsletter, social media schedule if I just let people know about the change. I can write just for my own mental, spiritual, emotional, and physical health, and not another person in the world has to read it. Help is available if I ask for it. In the weeks of our most recent fertility treatment, I finally realized I need some help with the business side of things, so I asked a friend if I could hire her for some administrative tasks. She agreed and has been amazing at helping me keep up with things. (And this week, so many friends have come to pick our strawberries at the farm. It’s been so helpful to not see them going to waste. It’s okay to let some things go. Yesterday, I didn’t get a post up at my Our Folks’ Tales site. A while back, I had set the goal of posting there weekly, but since I hadn’t announced that goal, I felt okay letting that slide. Sometimes, we just can’t keep doing it all. Celebrating the simple things is sometimes the most creative work we do. This morning, I got really excited to think about sitting on the deck my dad and step-mom have just built, about enjoying some iced tea with them on a warm, summer evening. Each evening, when the work that must be done is finished, I take out cross-stitch and sew. Then, when I head to bed, I look forward to wrapping myself around my new body pillow for some great sleep. These things refill me. These things give me joy. Last week, a friend sent me this wonderful story about Mr. Rogers. And it has been sitting with me, reminding me of something I know well but often forget: to be able to love people well, to be able to write well, I have to have space in my life. Space to sit down and listen. Space to not be hurried. Space to rest. So I’m stepping back from some things, letting some things go, asking for more help, and enjoying every minute with this little life growing inside me. Because, friends, this is my only life, and I want to love it. Today is the last day to get our special limited time price for our upcoming Writers’ Retreat here at the farm. Tomorrow, the price goes up, so be sure to scoop up one of the remaining 15 seats today. All the details and registration information are here. Hope to share the farm with you in a few weeks.